Athleten Deutschland urged the IOC to distribute a larger share of revenue generated by the Olympic Games to athletes and to provide increased independent representation for competitors, without influence of sports bodies, in a statement yesterday. The group also outlined a series of proposals which it claims will "ensure athletes rights are sufficiently respected and upheld" in the position paper. It comes just over a week before the IOC holds an International Athletes' Forum in Lausanne, where increased representation for athletes and awarding them a bigger proportion of Olympic revenue are expected to be among the main topics discussed. "All of the topics you have mentioned in your letter are already included in the programme of the International Athletes’ Forum," the IOC said in a statement sent to insidethegames. "It is surprising to read many of your claims. "In fact, the IOC has already taken many of the mentioned initiatives on board." The IOC also claimed it had discussed similar proposals when a group of German competitors met with senior IOC officials, including President Thomas Bach, in September. 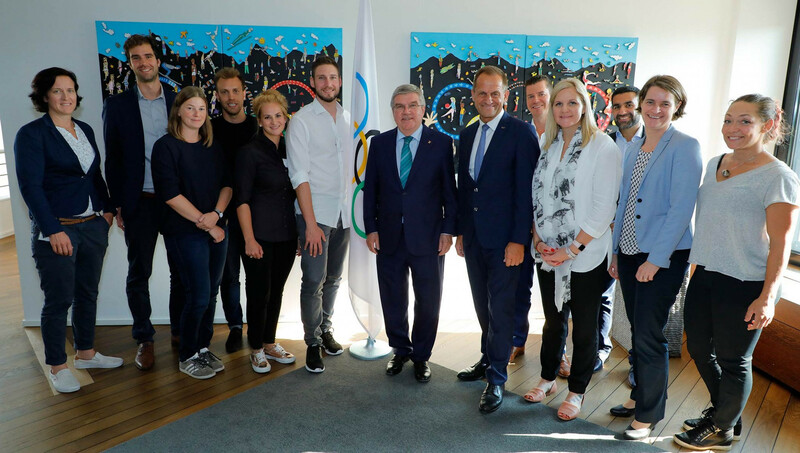 The invitation came after an open letter written by the German Olympic Sports Confederation (DOSB) Athletes' Commission, chaired by fencer Max Hartung, was published last May. Addressed to Bach, the letter called on the IOC to revolutionise their funding model by granting 25 per cent of revenues directly to athletes and a further 10 per cent to the World Anti-Doping Agency (WADA). "They were presented to you and your representatives and were acknowledged by you in our meeting in September 2018 and further exchanges that we have had since," the IOC added. "We are always happy to engage in a constructive dialogue and to improve our initiatives even more." A recent decision in Germany, which significantly scaled back the organisation's Rule 40, has been hailed as a success by athletes but both current and former competitors have insisted they are entitled to more. A host of athletes have also spoken up in recent months to demand increased representation in the decision-making process within major sports bodies. Athleten Deutschland believes the IOC should help oversee the creation of "truly independent and professional athlete representation" without the influence of sports organisations, such as International Federations. The topics are expected to dominate discussions at the International Athletes Forum, scheduled to run from April 13 to 15 at the SwissTech Convention Centre. The list of attendees for the forum, which the IOC claim will be the "biggest-ever", was announced today. Athlete Commissions from all 206 National Olympic Committees (NOCs) have been invited, along with similar bodies from International Federations, the WADA and the International Paralympic Committee. It is hoped the Forum will help unite the athlete voice following a public dispute between some competitors, largely involving the athlete groups at the IOC and WADA, in the fallout to the Russian doping scandal. The IOC has also publicly criticised those who claim to speak on behalf of athletes, including the WADA Athlete Committee, repeatedly stressing how its own Athletes' Commission is "democratically elected" - even though appointments to the body have been made in the past. "The athlete world is complex, facing different needs and issues in many areas," IOC Athletes' Commission chairperson Kirsty Coventry said. "The 9th International Athletes’ Forum will give us a chance to listen to each other, have constructive discussions on critical topics and learn collectively from our experiences. "The athletes’ voices are invaluable, and having the NOC Athletes’ Commissions present, with all other participants, at this edition will ensure an even more diverse and effective exchange of views." Sessions entitled "direct and indirect support to athletes" and "the changing landscape" are due to be held at the Forum, along with a question and answer session with Bach. The IOC Athletes’ Commission Strategy, launched in November 2017, will also be discussed, alongside the athletes’ declaration of rights and responsibilities, a documented endorsed by the IOC Session in Buenos Aires but criticised by a coalition of athletes, their global trade union and human rights activists.